In the Greek elections of 17 th June 2012 , the ultra right wing party Golden Dawn won 7% of the popular vote , giving them 21 legitimate members of parliament. Their ideology is clearly fascist and the black-uniformed members unabashedly use the right hand raised, nazi salute to greet their fuhrer Mihaloliakos . On a regular basis, Golden dawn members organize a variety of direct actions: food and clothes handouts only for Greeks, attacks of the stalls and shops of migrant merchants, as well as the eviction of refugee squatters. They recently set up a hotline for Greeks to get help in dealing with migrant tenants and also organised a ‘pure’ blood bank providing and accepting donations to and from Greeks only. Migrants , whether legal or not , are regularly victims of racist attacks in which the perpetrators are never found nor charged. Javet Aslam , president of the Pakistani community estimates around 700 to 800 victims in the last two years. When there is a police presence , often both victim and attacker are taken for questioning and then released. In some cases, the attacker is released and the victim is detained because of his “illegal” status regardless whether he is wounded or not. In this environment of fear and lack of justice most victims do not file a complaint nor press charges. 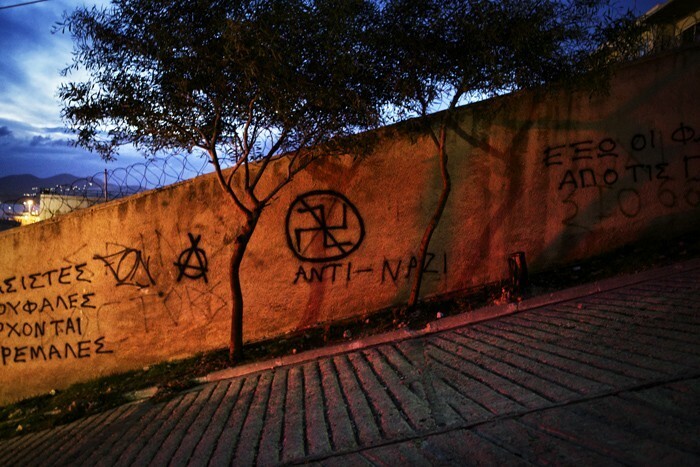 Even if most of these attacks are racist driven, Golden Dawn’s violence does not stop here. Homosexuals , anarchists and leftists as well as people who simply do not share their ideology are also victims of this violent political strategy.